Last year, I started writing a short mini-series for one of the Kindle Worlds, and since then, Kindle Worlds has closed down and I’ve been given the rights back to my Lavender Vale series. Which I’m really thrilled about. I hadn’t meant to fall in love with this series the way that I did. When I first decided to join the world, my intention was to write a couple of books that didn’t mean much to me, because I knew I’d be losing my rights to them. In return, I’d gain some new readers from the shared group promotions. I love how God works. I’d almost pulled out because after writing the first book, I wasn’t sure if I was willing to let it go. That book that wasn’t supposed to be important, ended up being very important. But I didn’t want to go back on my plan, and I felt the Lord urging me to trust and follow through. He just has a better perspective on things then we do, so trusting is always the best course of action for a child of God. So, as it stands, I know have my Lavender Vale series back and I’m in the process of republishing them with a new town name. And I’m thrilled because I’ve so enjoyed writing about this little Texas farm. I actually visited a Lavender Farm here in Texas a year or so back and was simply enchanted by it. While there, I knew a place like that would make for a beautiful setting. I love beautiful settings in stories. I hope you’ll go check out my website’s Lavender Vale books page. There’s a lot to see, read, and even a couple of takeaways. Please check out the downloadable Scripture cards I made that can be used as bookmarks or simply inspirational motivators to hang around your home. Enjoy and I hope you find something there that blesses you. Merciful Love (Formally Love’s Mercy) is still selling for only .99¢ until the end of August when book 2- Graceful Harmony will be released. 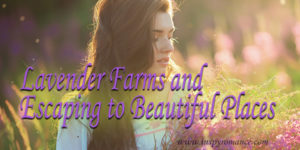 After that, all Lavender Farm books will be going for $2.99. I’m now working on the third book which is Ben’s story and like how it’s coming along. Today, I’ll be picking one reader to receive an Advanced Reader’s Copy of Graceful Harmony. Faye Andrews wants to keep the shameful truth about her real father a secret. Chase Michaels wants to make his guardian’s last days as peaceful as possible and vows to protect him at all costs. Faye’s life is heading down the road to nowhere when her mother shows up with a request Faye wants to refuse, but can’t. Her bio-dad is dying and she needs to head south to Sweet Grove, Texas, and help set his affairs in order. Except, bio-dad doesn’t want her help, he wants reconciliation. He wants her love. Chase’s life is spiraling out of control. His guardian, Heath, the only person left who cares about him, is dying. Vowing to protect him, Chase is wary when the legitimate heir arrives and worries that she’ll make Heath’s last days miserable and ruin all the hard work Chase has done to the farm. A man on his deathbed. An estranged daughter. A young man who belongs to no one. And the mercy they find in a loving God who brings them all together. I love all things lavender! I will definitely be checking out these stories, thank you for sharing! Hi Jackie! In Michigan we have several lavender farms, one about 20 miles away and Cherry Point Farm in Shelby has a giant labyrinth. I actually had a plant in my yard once, but it never did very well – I have a brown thumb. 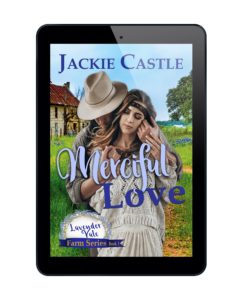 I enjoyed reading Merciful Love – the title sums up the theme of the story. I felt Faye’s turmoil and was surprised at an unexpected twist in the story, which is actually hinted at on the cover. Looking forward to your new release, Graceful Harmony – the cover is outstanding. This retiree enjoys receiving and reading ARC. Best wishes on your new rereleases. Enjoy your weekend. I have been trying to grow it here in Texas, too. I know it can grow, but it’s one of those finicky plants that has to have everything so-so. LOL. I’m somewhere between being a green and brown thumb. I usually put a plant in the grown, try to remember to water it and hope for the best. Those that are still growing are hardy plants that’ll survive anything. Including me! ha. I still remember the lovely lavender my dad had growing around an old cistern when I was younger. Dad has a green thumb still at 93 years old. Me, not so much. I’m glad your Lavender Vale series is back in your hands. Me too. I’m still trying to successfully grow lavender…. I have two new plants sitting on my window sill waiting for October when I read is the best time to plant them in Texas. Will see how it goes. It is amazing when God shows how much he loves us by doing stuff like this! I have never been near a lavender field, but would like to one day! I was honestly surprised to find that Texas actually had a few. The one I went to was newer and small, but we had a wonderful day out there. I love the idea of the setting and story. We have a backyard now for the first time in over 30 years, that actually gets sun and has space. We planted a butterfly garden and included lavender. Unfortunately all the lavender died. Other plants did well and we now have a lot of butterflies. We planted lavender at my sons house and two plants did well. Lavender isn’t easy to grow. I’m still trying. I know it’s possible. I’ve seen it. lol. And I’m determined to succeed at this. Ha. Merciful Love looks good!! I love the cover, too. Here in California, my dad bought a lavender plant about 6 years ago and it grows without me doing anything. I don’t even water it during the summer! We’ve been wishing he’d planted it on the other side of our garage because it’s totally overtaken an area that had other flowers in it! Thanks for sharing the blurb about Merciful Love. Looks like a great story. I remember a big shout out for Kindle Worlds, I didnt realize the reason why I’d never heard about it again was that it closed down. I wonder. Thanks for sharing your new path with Merciful love. Yeah, it was only three months ago that all of us found out about the closing. For me, I was glad to have my books back. I have more ideas for this series and now I can explore those options now. This sounds like a wonderful series. Love the name. I love the smell of lavender and the color lavender. I’ve tried to write those unimportant books too, Jackie. It never works out for me either. I’m glad you have control now. Love the smell of lavender and love the book review. Sounds like a series I’d enjoy. Sounds so amazing, inspiring even. I love your blog page and I can not wait to read your books. 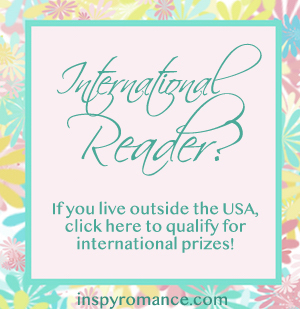 Thank you so much for sharing love the Lavender and Thank you for the awesome giveaway! A great reminder to trust in God and remember He makes all things work together for our good. Thanks for sharing. These sound like great stories!